Some 50 Africans and Americans gathered in Asheville, North Carolina, August 4-7, to reunite, visit, and honor deceased members. What drew them? They were all persons from or who have worked in Sierra Leone, a nation on the tropical west coast of Africa. One in particular was missing--our Treasurer, Anna Morford, who remained home in Philomath, OR, nursing a very sore knee. Lucy and I visited with Anna in Philomath on Sunday, August 22. She's improving but still not well. I've previously acknowledged the contributions of many SOSL members such as the Rev. Jack and Dolores Thomas, Rev. Clyde Galow, Dr. Mabel Silver, Dr. Winnie Bradford, Dr. Les Bradford, several African medical personnel and educators. Read their inspiring stories right on this blog-site. Click here. Today I tell of one additional American couple with a great servant relationship to Sierra Leone: the Rev. Lowell Gess, M.D., and Ruth Gess (deceased). Their values were and remain the most focused and targeted that one could hope for in mortal human beings. a lifetime of learning (medical skill, African language, and African culture and health- ways). Lowell and Ruth, in other words, were and are model human beings. Lowell completed his three-year theological course at Evangelical Theological Seminary in Naperville, Illinois, years ago. During and after seminary he served as a pastor of The Evangelical Church, one of the group of denominations that later formed The United Methodist Church. Next, he achieved an amazing, virtually unique accomplishment: he gained his M.D. degree while leading a flock as a young pastor. Lowell and Ruth then applied for missionary service. After three years of service in Nigeria the Gesses were reassigned to Sierra Leone. They served in the Rotifunk hospital and in other locales. At Rotifunk, Lowell realized the need for ophthalmology in Sierra Leone. Eye diseases were prevalent and no specialized treatments were available. After qualifying through yet-additional training Lowell saw and treated many cases of glaucoma and cataract diseases. Lowell and Ruth retired from missionary service in 1975 (so far that’s a twenty three year career in that capacity) and returned to Minnesota. There, Lowell began a private ophthalmology practice. But they remembered the great need for medical eye care in Sierra Leone. Lowell took the lead in starting an Eye Hospital in Kissy, Sierra Leone, a neighborhood in Freetown, the capital city of the country. Demand outstripped the original facilities. Lowell then helped to found and fund a larger facility dedicated to eye care. A couple of years ago, at age 90 for Lowell, the Kissy Eye Hospital was renamed the Lowell and Ruth Gess Eye Hospital. What a fitting honor! Lowell returned to Freetown during the Ebola crisis. His purpose was to support and encourage the hospital staff, strained to the limit by medical needs and infection risk. As he was preparing for the visit, some reminded him that he might contract Ebola himself and die in Sierra Leone. He was prepared for that possibility, he said, and if that were to happen he would prefer a burial in Rotifunk, where he and Ruth had served years earlier. Lowell chatted with me at the SOSL meeting in Asheville. He also gave cogent observations from his recent visit to the Eye Hospital. He inspired me with his commitment and his cogent recall of the Ebola crisis. In conversation in Asheville Lowell recalled that his and my deceased family members are buried together in the old Evangelical Church cemetery in Paynesville, Minnesota. Lowell said that Warren Reeck had been his best friend during his school days and beyond. Lowell was very familiar name to me since, during my childhood family reunions in Spokane, Washington, "Warren" was a person my Reeck clan members frequently spoke cited as the contact person back in our family homeland” in Central Minnesota. In fact, one of my aunts named her son “Warren,” probably in honor of Warren Reeck of Minnesota. The old Gess/Reeck family ties run 'way back to the late nineteenth century. 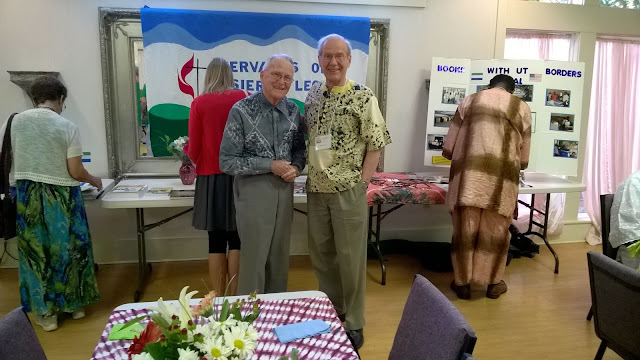 In reflecting on the SOSL reunion I realized that Lowell resembles Dr. Albert Schweitzer, who founded a mission in the Congo, Like Schweitzer, Lowell is a clergy-person and a medical doctor. Further, like Schweitzer, Lowell thinks deep spiritual thoughts. I’m going to call Lowell Gess THE ALBERT SCHWEITZER OF WEST AFRICA. It was an honor to be in Lowell’s and other members' presence in North Carolina this month. If you wish to contribute to the strategically important Lowell and Ruth Gess Hospital in Kissy, Sierra Leone, click here for instructions.